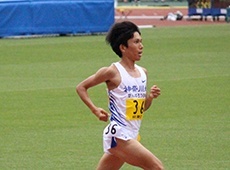 Hikari Ueno, a third year English major at Kanagawa University and a sprinter in the university’s Track and Field Club, translated an article on the 49th Prince Chichibu’s Cup All-Japan Intercollegiate Ekiden on Kanagawa University Ekiden team, hoping to let students from other parts of the world know the great efforts made by the Ekiden team members and to share her enthusiasm for Ekiden as an aspect of Japanese culture. Hikari is also the Second Prize winner in 2017 Kanagawa University English Speech Contest organized by the Department of English. The champion team was never in a hurry even though they had to chase the lead from the beginning of the race. During Section 5, Koshikawa, who got the 5 Section prize3, raised the ranking from 4th to 2nd. 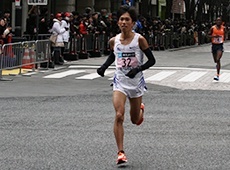 After this section, the rest of teammates brought the tasuki (a fabric relay baton used in ekiden) to Section 8, and from then, the time difference was 17 seconds between Jindai and Tokai, who was leading then. “I was so excited,” Suzuki said. “I thought I should just focus on my run at my pace.” He took the lead after 3 km, and made more distances without pacing down from following runners calmly. 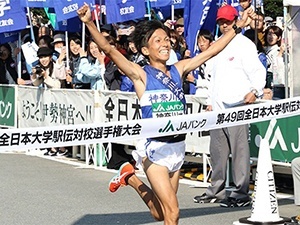 The Jindai Ekiden team’s captain Suzuki won the Japanese Student Half-Marathon Championship4 this March with a new game record of 1 hour 1 minute 36 seconds. He also got 3rd place at the Universiade5 this August, and so he had enough potential to pass the Tokai team. 1 The race began in 1970, and it decides the No.1 University Ekiden team in Japan. Runners take turns to run 8 sections. Also it is the one of "sandai Ekiden," the three major Ekiden races, including Izumo, and Hakone. Every Ekiden runner aims to win those three Ekidens. 2 The Tokai university team won the Izumo Ekiden and has runners with good record. 3 The fastest person in each section gets this prize. 4 About 1,500 students compete in this one, and it also serves as a selection process for the Universiade. 5 It is an international competition for students aged 17 to 28, who are university or graduate students or graduated from those schools 1 year before the competition year. ※This article was written based on the news story appeared in Kanagawa Shimbun on November 6, 2017.